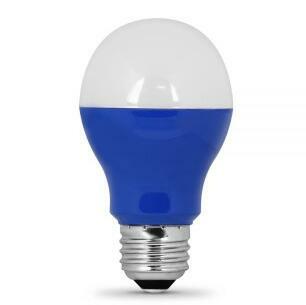 E26 120V Blue 3W A19 LED Bulb is certified by the Florida Fish and Wildlife Conservation Commission’s Wildlife Friendly Lighting Program to be sea turtle friendly. This Feit Electric bulb is rated for a lifespan of 25,000 hours and uses just 3 watts, making this a cost effective way to create fun, stark holiday, party, accent or decorative lighting. The color of this bulb is blue, offering a brightly colored light that can fill a room with a beam angle of 200 degrees.